The holiday season means lots of delicious feasting. As a guest it is customary to bring a side dish or even better a bottle of wine. To dress up the naked bottle (especially if it is under $100 LOL!) I think these wine bottle tags are the perfect way to show that you put some thought into your gift. With the Avery Elle die it is a simple task to turn an autumn print card stock into a festive decoration. For this bottle tag, I used the cute Lawn Fawn stamp and die sets (Forest Feast). I really like the tree stump table (trimmed to fit the tag) which was easily made by stamping black ink onto brown card stock. The animals and food were colored with Copic pens before die cutting. 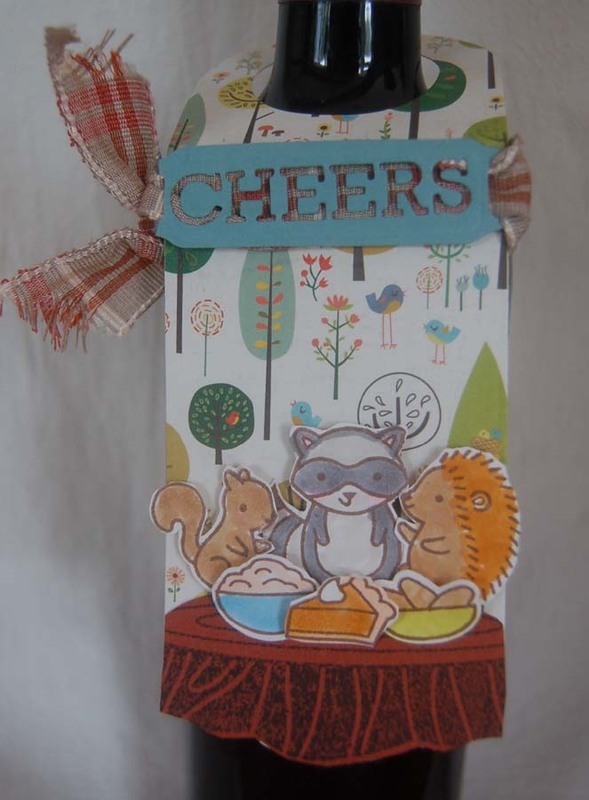 The 'cheers' label was cut with the Spellbinders Ribbon Tags Trio and the word was cut with the die from the Avery Elle set. For both tags the ribbon was strung through the tag which made the words stand out. I tied the ribbon on one side to give the tags an asymmetric jaunty look. The gnome image (Viva Las Vegas Stamps) is one of my favorite images....maybe I should get a lawn gnome decoration...LOL! 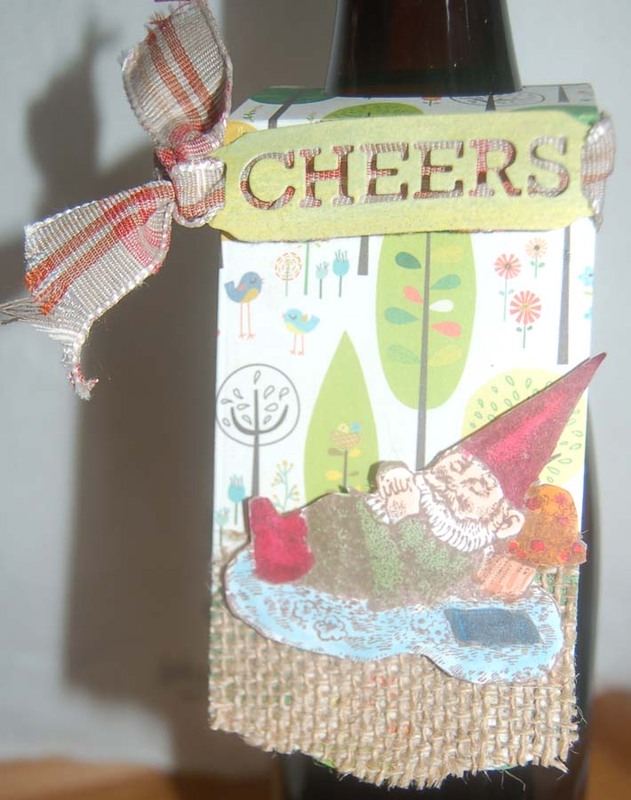 I cut some burlap (large sheet purchased from HM Ben Franklin Crafts) to fit under the gnome after I colored the image with Copic pens and fussy cut it. 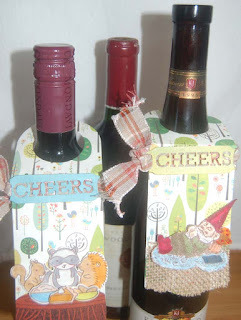 Both bottle tags are similar but equally attractive to dress up a wine bottle. If the dinner host is not a fan of wine, you can use these tags on a gift of Balsamic vinegar or a specialty bottle of olive oil. 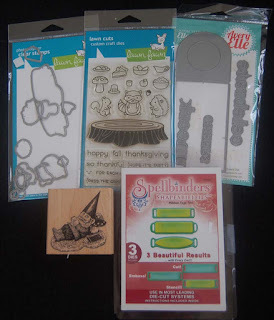 I have another idea for using these tags so please visit this blog site again and leave a comment if you have some time to spare. I love hearing from you!